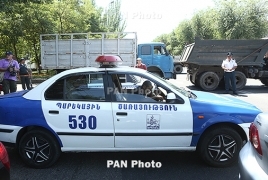 PanARMENIAN.Net - A group of armed people on Sunday, July 17 stormed the patrol service of the Armenian police and took everyone inside hostage. The group are members of the Sasna Tsrer movement. One police officer was killed, and three more were wounded. 11:45 pm: Pavel Manukyan said Jirair Sefilian had no idea what was going on. "He didn't know anything of what we had done. I briefed him on the situation, and he told us make further decision by ourselves," Manukyan said. According to him, their demands haven't changed: they want the release of Sefilian for further negotiations. Asked whether they are going to surrender, Mankuyan gave a negative response. "We are going to fight to the end. We'll do everything to ensure the safety of the captives even if the police storms the premises," he said. 8:40 pm: Hunan Poghosyan said that Jirair Sefilian isn't involved in negotiations with the armed group. According to him, there are currently four wounded officers. 7:30 pm: As of 5:00 pm, the armed group still holds several policemen hostage, Armenia's National Statistical Service said. The special forces remain in a state of operational readiness at the scene, the NSS said, although no command for an attack or any other activity has been given to them. 5:30 pm: President Serzh Sargsyan held a meeting with representatives of the law enforcement system. The attendees briefed the President on the situation following the incident that happened in Yerevan early in the morning, as well as the measures taken by the law enforcement bodies. The latter, according to the presidential press service, continue controlling the situation and taking corresponding steps to reach a settlement of the issue. 4:45 pm: One of the members of the group said negotiations are still underway with the law enforcement authorities. According to Pavel Manukyan, the National Security Service has offered to take the gunmen to Jirayr Sefilyan but they have refused and demand instead that Sefilian be released. Also, Manukyan said they have required journalists but the police have refused to fulfill their demand. He said two of their gunmen were wounded during the shootout.In response to a question on whether they are going to release the hostages, Manukyan gave a negative response. Asked if they are sorry for the officer killed in the shootout, the gunman said: "We are sorry for everything. "Commenting on a possible attack which could endanger the lives of the hostages, Manukyan said: "Everything is possible." 3:45 pm: Deputy Police Chief of Armenia Hunan Pohosyan told reporters that negotiations are still underway with the gunmen. The gunmen have one demand, i.e. the release of Jirair Sefilian, which, according to Poghosyan, is impossible. A police colonel, Artur Vanoyan was killed, while colonel Aram Hovhannisyan, lieutenant colonel Hrach Khosteghdyan and sub-officer Gagik Mkrtchyan were wounded. 2:20 pm: MP Nikol Pashinyan said he knows nothing about the police's plans, but said the group members are determined and don't intend to retreat in the event of an attack. Also, the MP said he is going to meet with Jirair Sefilian at the detention facility he is currently being kept in. 1:55 pm: One of the wounded police officers was admitted to Muratsan military hospital. He was wounded in the abdomen and has already undergone surgery. 1:45 pm: Several people, including activist Vardges Gaspari were detained at the Freedom Square near Yerevan's Opera House. The gunmen earlier called on the public to gather at the square "for planning the next steps." 1:30 pm: The NSS said a police officer was killed and two more were wounded in the hostage situation. Two of the hostages were set free following the National Security Service's operative measures, the NSS said in a statement. 12:56 pm: Local residents told a PanARMENIAN.Net correspondent that the operation began at around 5:30 am. A powerful explosion was first heard (probably the truck hitting the gates - editor's note), followed by gunshot fire. 12:38 pm:Commander of the Internal Troops Levon Yeranosyan, Deputy Police Chief Hunan Poghosyan have arrived at the scene. Poghosyan urged the public to go home for their own security. 11:41 am: Police cars and armored vehicles have blocked the road taking to the Erebuni police department. Journalists are barred from entering the area or reporting on the inicident, RFE/RL Armenian Service says. Head of the press service of the Armenian police Ashot Aharonyan said they will soon issue a statement. 11:15 am: The NSS reports that state authorities continue their normal operation, while law enforcement authorities are properly carrying out public safety functions. Negotiations are currently underway with the armed militants for them to peacefully surrender to the Armenian authorities, the NSS said. As the press service of the National Security Service (NSS) reports, their supporters use news outlets and social media platforms "to spread disinformation about starting an armed uprising, capturing buildings and premises." Armenia's NSS declared that the information does not correspond to reality. 10:35: Founding Parliament member Varuzhan Avetisyan, who also from "Sasna Tsrer," said that those seizing the building are members of the initiative too. They demand that founder of the movement Jirair Sefilian who was arrested several weeks ago, be set free. He said that the police used an armed vehicle to attack those seizing the building, a retaliatory fire broke, injuring several people. In an interview with Armtimes.am, Avetisyan said earlier that after Sefilian joins them from jail, they will proceed to the next stage of their demand, i.e. resignation of [President] Serzh Sargsyan and transfer of power to the people. Sefilian is the one to conduct negotiations, he said. He also added that they have Deputy Chief of Yerevan Police Valery Osipyan and deputy chief of police Vardan Yeghiazaryan.